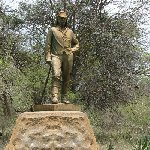 From the northern tip of Zimbabwe where we went to visit the Victoria Falls we crossed the border with Zambia to view the falls from Livingstone where the Mosi oa Tunya National Park is located. In theory the Mosi oa Tunya Park and the Victoria Falls are the same thing but located in two different countries they were found in title of their right to name the park how they wanted to name it. 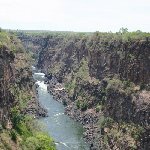 From the Victoria Falls in Zimbabwe most people make the cross-over to Zambia because you're nearly there and viewing the falls from both sides makes the experience complete. 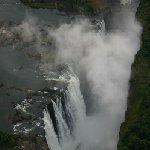 Ours got even better when our guide told us we were going to view the falls of the Mosi oa Tunya National Park from the air, during a helicopter ride! The ride was amazing, I couldn't have had a better view of this amazing site and the whole ride felt like a dream. I couldn't help thinking, what if I would fall out of the helicopter above the Victoria Falls?! Well, luckily everything went more then fine but if it had happened, I couldn't think of a more surreal and beautiful place! Did you enjoy Mosi oa Tunya National Park and have you been on a holiday in Livingstone, Zambia?